Odisha presses forward against Telangana in a crucial match. 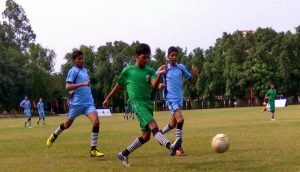 New Delhi, September 14: Thirtysix boys have been picked from the inaugural National Talent Search and Nurture football championship to attend a camp at the SelaQui International School in Dehradun from October 13 to 25. 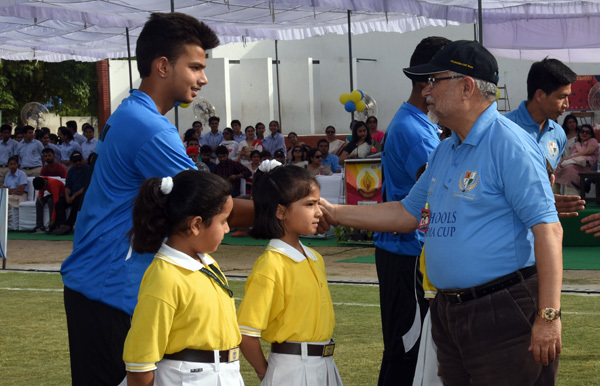 As many as seven of these boys are from Haryana, which emerged champion of the School Sports Promotion Foundation event here on September 2. Goalkeepers: Aleef Rahman Mollah (DPS Sushant Lok, Gurgaon), Prasoon Kumar Rai (Sant Atul Anand School, Varanasi), Rangrez Abdulla (Zilla Parishad School, Osmanabad) and Shreyan Dev Singh (JK Public School, Jammu). Defenders: Eashav Singh (MV International School, Kathua), Jitendar Manjhi (SS High School, Simdega), Abhishek Aggarwal (Campion School, Bhopal), Mohammed Sohel Mansuri (Nirmala English Higher Secondary School, Korba), Fleming Sotra (DBN Vidya Mandir, Jammu), Sunny Singh (Scottish High, Gurgaon), Ashu Singh (Summerfield, Gurgaon) and Aniket Parasher (DPS, Bhopal), Aryan Raj (DPS Patna), Chotelal Mahto (Urdu Town High School, West Singhbhum), Amir Shapuri (Islamic Composite PU College, Belgaum) and Sameer Thapa (Army Public School, Varanasi). Midfielders: S Masthanvali (Little Birds High School, Kurnool), Ali Khan (KC Public School, Jammu), Jitender Mahto (Catholic Ashram School, Ramgarh, Jharkhand), Kaushik Patil (St Mary High School, Belgaum), Parwaz Singh Gill (Scottish High, Gurgaon), Raj Kishore Mahto (SS High School, Simdega), Hansit Varshney (Scottish High, Gurgaon), Gaurav Rai (Army Public School, Varanasi), Anmol Soni (Decent English School, Bhopal), Mayank Singh (Sri Guru Goving Singh High School, Patna), Aashish Kumar (Kernriya Vidyalaya, Kankarbagh, Aayan Taragi (Scottish High, Gurgaon), Shubham Sangwan (Kendriya Vidyalaya, Hyderabad), Vipin Yadav (APS, Gwalior). 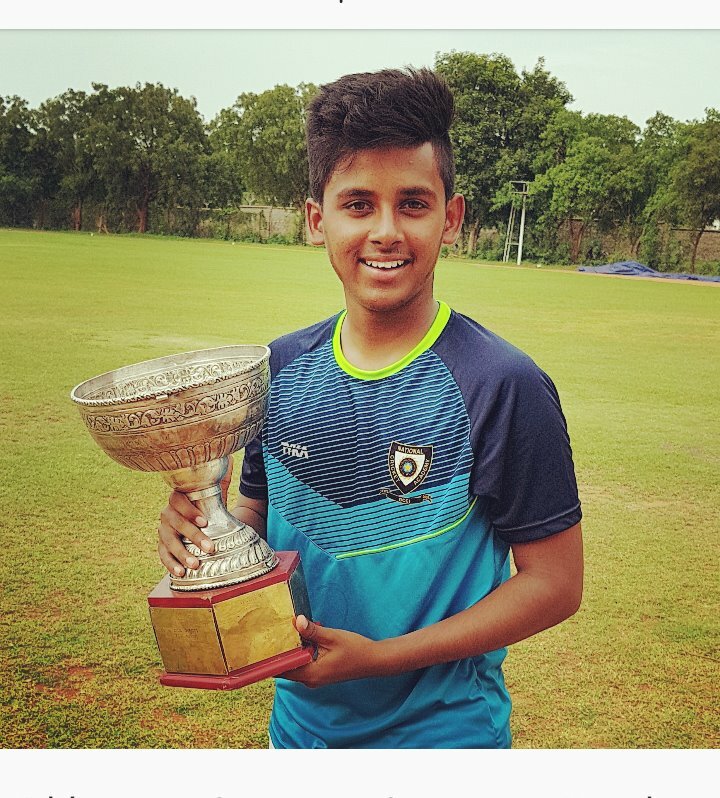 Strikers: Rajat Rathi(DPS Sushant Lok, Gurgaon), Nishant Chandra (St. Michael’s, Patna), Priyanshu (DPS, Patna), Samir Kiro (SS High School, Simdhega), Shaurya Singh (MVMS Vidyalaya, Jaipur) and Rajat Singh (Stepping Stone Intermediate College, Varanasi).